Thirty-four years ago, the very first Equicizer he built enabled the 1980 Eclipse Award-winning apprentice jockey Frank Lovato Jr. to recover from a broken leg and return to the saddle. These days, Lovato’s distinctive mechanical wooden horse is at the center of his world and continues to deliver the support he needs. Not only is the Equicizer his entire livelihood–Lovato, 53, works in his shop seven days most weeks–the business is helping him cope with the loss of his wife Sandy, who was killed in a car accident in Sept. 2014. 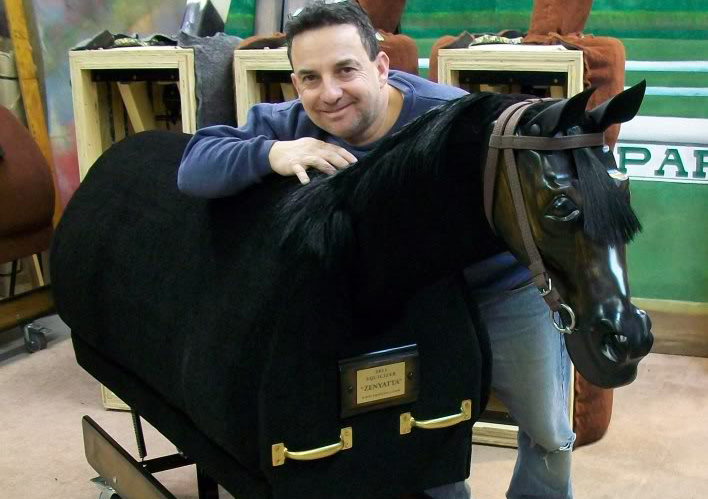 Through the decades, Lovato has produced nearly 1,200 of his hand-crafted Equicizers, which can be found at racetracks, equine centers, small stables and in the homes of horse lovers around the world. His invention, born of necessity, enables riders, from novices to pros, to develop fitness and balance and work on techniques in a controlled environment without being far from the ground on the back of an animal. Lovato came up with the concept of a horse-shaped device as he struggled to regain flexibility in his damaged left leg. The idea worked and he soon was fulfilling requests for personal Equicizers from other jockeys, including two of the biggest stars in racing history, Laffit Pincay, Jr. and the Angel Cordero, Jr. In the 2000s, Lovato’s creation was used on the filming action closeups in the move Seabiscuit and to teach actor Toby McGuire the basics of riding a Thoroughbred. Last year, the Equicizer picked up some unsolicited but welcome national media exposure with jockey Victor Espinoza shown warming up for rides on Horse of the Year American Pharoah. While those snippets of coverage on NBC telecasts and pictures in publications certainly were a plus for the business, they also had a restorative effect on the outgoing, energetic Lovato, who had retreated from view and put aside some of his other projects and passions following his wife’s untimely death. The short answer is that he has been dealing with his grief while building Equicizers in his shop situated about 60 feet from his house in Norwalk, Ohio, his wife’s hometown. They moved their family to the small city 50 miles southwest of Cleveland after he completed his 25-year riding career in 2004. Though the Wooden Horse Company was the foundation of the Lovatos’ post-racetrack life, they both invested many hours in their individual non-profits. Sandy Lovato, who had worked at tracks and for Equibase before his retirement, dove into therapeutic riding, gained certification as an instructor, and founded Stampede of Dreams, a local riding group for children and adults with special needs that continues on. He worked on fan education through his Jockey World, creating content for its website, conducting summer camps for children interested in racing, writing a magazine article, “What It Takes to be a Jockey,” that he turned into a DVD. In 2013, Lovato and his assistant Kayla Jarvinen, completed a video package, 365 Days of Racing Terminology. Despite their many successes, it wasn’t a smooth ride in Norwalk and the Lovatos encountered problems. In 2011, they sold the business to another company and became employees of its Equicizer division. A year or so later, the Lovatos were laid off and the division was closed. Lovato said he doesn’t know where he would be today without the Equicizer, which has a base price of $2,995. He makes about 80 a year for customers around the globe. “There was a point that I didn’t think I was going to be able to get it back,” he said. “I really, really did not know what I was going to do. I just couldn’t see myself doing anything else. Sandy used to tell me ‘If anybody can get it back, you will, and if anybody will make it work it will be you’ because she says I am relentless, just relentless. Sandy Lovato’s death came six months after they had reacquired control of the company and the rights to make Equicizers again. They were delighted to find that there were plenty of people interested in their product and ready to order. Lovato’s father, Frank. Sr., was a jockey and he followed him into the family business as a teenager in the 1970s. During his championship season, he won 249 races and his mounts earned $3.7 million in purses. He became a very popular rider on the New York Racing Association tracks and spent the last few years of his career on the Chicago-Kentucky-New Orleans circuit. Frank and Sandy Lovato met at Hialeah Park in 1979 and were married in 1982. They have three children and two grandchildren. Their daughter Megan handles the books for the business and their youngest son, Timmy, is a student who helps out in the shop. Time has helped ease the pain a bit, but Lovato said he has not gotten over his wife’s death. With Jarvinen, and his family on his team, Lovato has seen the business grow. Thanks to the savvy use of the Internet, the little company, whose most important player is one personable, retired jockey with a vision and serious woodworking skills, has an international clientele. 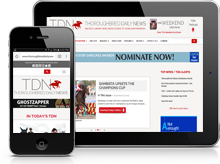 Among his current customers is a woman doing equine therapy in Singapore and a jockey school in Sweden. Lovato also constructs highly personalized Equicizers that run the gamut, from a customer’s beloved longtime pleasure horse to most famous Thoroughbreds in history. He made a Zenyatta for Hall of Fame jockey Mike Smith and has filled requests for Barbaro, Secretariat, Ruffian and Rachel Alexandra. In 2015, Lovato received a unique order from an elderly woman in England, whose riding days are over. Lovato chuckled as he told the Trigger story, clearly delighted that he assisted someone several times zones away who was making adjustments, reacting to the changes in her life. It’s something he understands all too well. Since his wife’s death he has put the Jockey World venture on hold and has stopped playing music–he was a well-known performer, solo and in bands, during and after his riding days–but has continued on with his old friend, the Equicizer. “After the accident, I just really was numb, but I just knew that I couldn’t lie down,” he said. “Sandy was the kind of person that if I were to disappoint her it would have been just lying down and giving up. I had orders coming in. I had people still excited about getting their Equicizer. “It did take a good solid week or so where I came in the shop and looked at things that I was supposed to do, looking at my order sheet and knowing that these people were counting on getting their Equicizer. It was like putting one foot in front of the other. That was one place where everything was going to be OK. That’s what kept me going.